This clock belonged to my grandfather who brought it with him when he emigrated to the united states in the early 1900s. It has been passed down to me from my father and I will pass it on to my son. It's an early 19th Century eight day clock. It has a moon dial that shows the current phase of the moon. The hand made case is a dark stained mahogany wood. 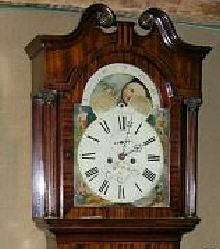 We have been told that our longcase grandfather clock is quite valuable, but that is of no interest to us. It's a family heirloom and a link to where we came from.